ASK THE DESIGNER- How can I preserve flowers from a special occasion? Can they be dried or pressed ? This is a question I get all of the time. While I am not at all an expert in this area, I do have some experience with floral preservation. Some of my very earliest wedding bouquets came with the request of persevering the roses and creating a pair of matching topiaries for the couples mantle. 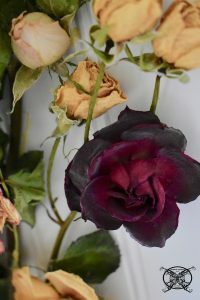 While roses are very easy to dry, not all flowers dry or press well for preservation; which is something to keep in mind. Today I would like to talk about 3 basic types of preservation methods; air drying, silica sand drying and pressing. 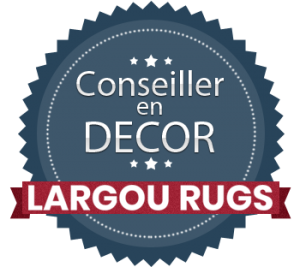 Then I would like to show a project that can be achieved with the results. Above is a vase of carnations that one of my neighbors asked me to dry or press for her. She told me that they were very special to her and she wanted to keep them forever, but she was worried that she would not preserve them properly. 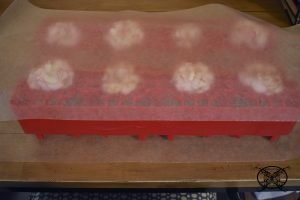 I explained that because they are white, during the drying process they will turn an ivory to beige color, but carnations are perfect for pressing. Since I have a specific idea of how I want the end creation to look, to surprise my neighbor, I am doing a very specific type of pressing to keep the heads of the flowers in an upright position. 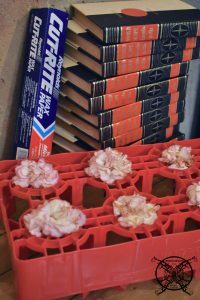 For this process I will need wax paper, an old soda crate and lots of heavy books, so these old encyclopedias will be perfect. 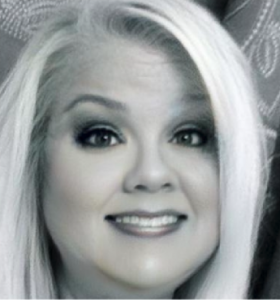 Yes kids, En-cyc-lo-pe-dias, Google for old people, where all our information came from, LOL! The first step is to cut the stems of the flowers short and feed them through the whole in the soda crate. The round shape will keep the flowers shape and the hole will allow air to flow up to the heads. If you are just book pressing the flowers flat you can skip this step. Next, you will cover the flower heads with wax paper. This will keep in floral juices from seeping out and damaging your books. 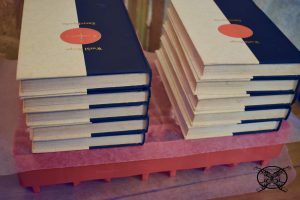 This is especially important, if you are pressing the flowers inside the pages of the books you actually like or if they are library books. Finally, you will want to pile on the weight and walk away. This process will take several months so patients is key. This type of process works well on thin leaf greenery and fragile flowers like forget me nots, pansies, delphinium, lily of the valley and astilbe. 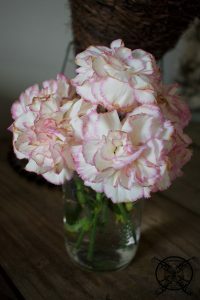 I have done this process on many carnations over the years from funerals and they press well too. Just a tip, the dark colored flowers like red or hot pink turn a lovely burgundy color. This is by far the easiest way to dry flowers and even herbs. 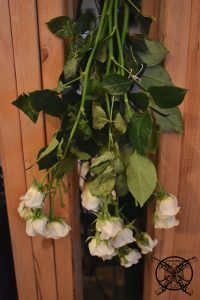 Take the flowers as a bundle and hang them upside down and leave them someplace dry like a garage or a basement near a dehumidifier. The reason to turn them upside down is to keep the flower’s neck straight. You see, as flowers die they wilt which causes their heads to droop. This part of the process keeps the necks straight upon drying. This is also the perfect way to bundle herbs such as lavender or sage and dry them for all kinds for holistic purposes, form smudge sticks to bath teas. 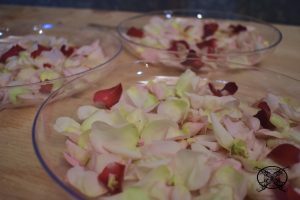 Another great air drying method can be done with rose petals. Below I have filled a plastic plate with a single layer of petals. This is basically how you make potpourri, once dried you add an essential oil to give it a fragrance. 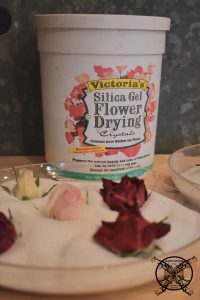 The third and final way to preserve flowers is with a Silica Drying Gel. This is essentially the same stuff that comes in those little packets you find in your shoe boxes that say “Do Not Eat”. It is highly toxic and I do not recommend using this around children or pets. When I work with this stuff my fur babies are completely locked out of the space. I do not even touch them until I have washed thoroughly. This stuff is bad news, like worse than Tide pods bad, so if you use it please read the instructions and wear safety goggles and gloves. So, you basically pour the sand into a shallow pan. Then set your flowers into the sand. 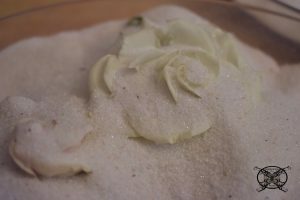 Continue to hand pour more sand into the petals to get the shape in which you would like the flowers to dry is achieved. 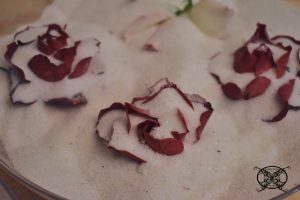 You can see the sand is slightly prying open the petals to give the roses a blown open or blooming look. Have the drying sand in these areas will hold the delicate petals into this otherwise unobtainable shapes. Just like the other processes above this will take several months to achieve the proper level of drying. 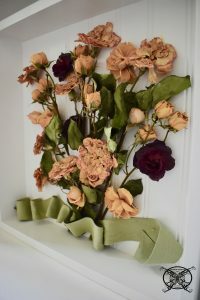 Now that time has passed and you have successfully dried your flowers, it is up to you what kind of collage you would like to make with these treasures. As I mentioned above, in the past I have turned a full red rose, bridal bouquet, into two mantle size topiaries for the couples first home. For myself, and my siblings I have created three domed floral arrangements that houses both my mother’s and father’s funeral blanket flowers as a memory keepsake. Today for my sweet neighbor, Ron decided to surprise her, and hand build a bead board shadow box with a few materials he had from a previous project. 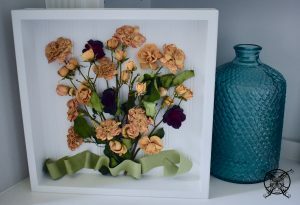 Then I was able to mount her dried flowers inside the shadow box to look like a hand picked bouquet. The second surprise I added was a few roses I had left over from her daughter’s last daddy daughter dance bouquet this year. I remembered how special it was for her to make sure that her daughter got one last set of flowers from her dad before she goes off to middle school next year. I just felt like they would really be a nice addition to make this one of a kind piece just a little bit more nostaglic for her. Nice post. 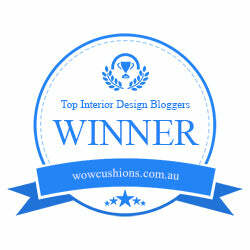 I was continuously checking out this blog and I must say I am so very impressed! Extremely helpful info particularly and very consistent 🙂 Thank you and best of luck. This is topic that I have always be interested in learning more about but never really had the time to research the proper way to do it. Thanks for all the time saving advice, it is really handy that you have both a interior design and floral design background. Your neighbor is a lucky lady that dried all art turned out so pretty. You really did a nice job and that shadow box is pretty special too! I used to make potpourri a long time ago with apples and roses, I used essential oils and such. It always amazes me how these things have a way of coming back around again. 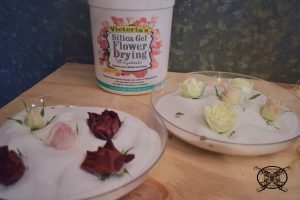 It has been so long since I have heard anyone talk about pressing flowers, I love that your a reviving such a traditional way of preserving flowers. 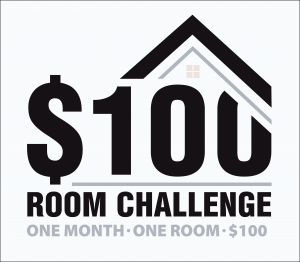 It is a nice homage to the rustic chic movement for all the farmhouse fixer uppers up there. Marianne I am so glad that you like it 🙂 We truly enjoyed putting the surprise together for you and had a little time to really think about it while those flowers dried out for 3 months, lol. We could tell how special they were to to you and wanted to make sure that your were able to cherish they for years to come. Thank you so much for my sweet custom surprise!! Ron, thank you for building the shadow box. I love it and can’t wait to hold it and hang it up in special place when we get home from our trip. You guys are so sweet and thoughtful and did a great job collaborating on this project. Love y’all!!! Jennifer, thanks a lot for the great post. 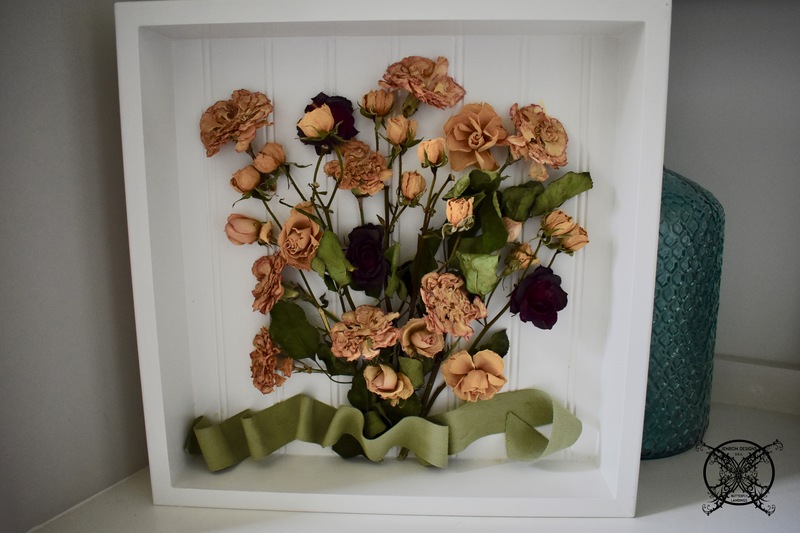 I have been looking for a trustworthy site that would walk me thought how to complete the drying process for fragile flowers like this. I also love the old fashioned pressing technique too. Girl you are always inspiring me! I have always wondered how to keep dying flowers. I may have to try it! 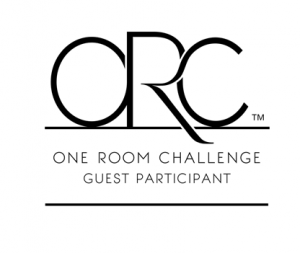 I am so excited about this! I have always wondered what else to do after drying out flowers by hanging them upside down. Can’t wait to add this to my list of DIY projects with flowers from my garden! I was surprised at how long pressed flowers last. I found some pressed flowers in my great grandmother’s bible, from her grandmother’s funeral. Forget me not’s, and they were still intact right next to her obituary, it was like a time capsule. Lisa lavender is perfect fro drying, you can make pretty little bundles for your bathroom or if you have a lot of lavender even give them away as gifts. Just add a little essential oil to make them fragrant again. Once they are dry they will hold the scent. This is gorgeous! I have always air dried my flowers by hanging them. I would love to try pressing flowers and the drying crystals look interesting. I didn’t know they made such a things! How cool! You are so creative Jen! That shadow box is a beautiful memento for your neighbour and so thoughtful of you. I will definitely hang dry some of the lavender from our yard this year!! This is so cool! I’ve only ever thought of just hanging em upside down. Never heard of the sylica gel, but I’d like to give it a shot! 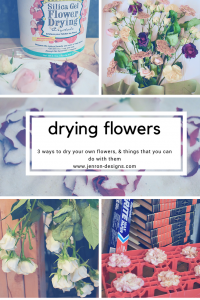 I remember my mom drying flowers when I was a kid and have often thought about trying it out myself but I never got around to it. Pinned this and I will be trying it, thanks! Great post and very useful information. Even though I didnt know much about preserving flowers I find this post very interesting. Thanks for sharing Jen.